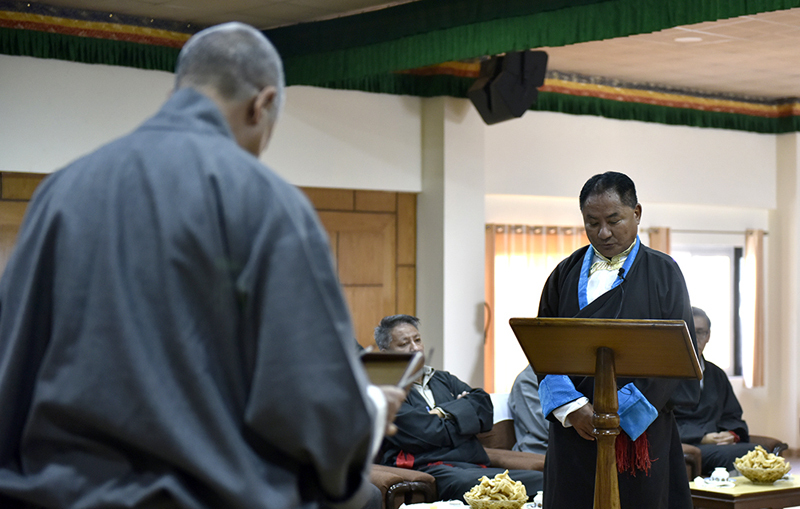 (TibetanReview.net, Dec03, 2018) – The currently longest serving member of the Tibetan Parliament in Exile, Mr Pema Jungney, has formally taken charge as Speaker after he was administered the oath of office by the Tibetan Chief Justice Commissioner Mr Kargyu Dhondup on Dec 1. He has been a speaker before and is known for his non-nonsense approach to ordering the house and addressing issues. His installation came at the end of the two-and-half-year term of the soft-spoken Khenpo Sonam Tenphel. Although the term of the Speaker is five years, it had to be split between them as the two kept getting the same number of votes without any possibility for breaking the deadlock. It was the only arrangement that could be reached in the parochially divided house. Khenpo Sonam Tenphel, born in Kham Rekhe in 1974, represents the Nyingma tradition of Tibetan Buddhism in the parliament. He has been a member since the 14th parliament in 2006, serving as the Deputy Speaker in the 15th and becoming the Speaker in the 16th on May 30, 2016. Pema Jungney, born in Ruthog Jangtod in 1959, has been a member since the 10th Parliament for a period of 28 years thus far. His current term ends with the end of the 16th parliament’s on 30 May, 2021. Acharya Yeshi Phuntsok is the Deputy speaker for the full term of the current parliament.